Light and feminine, reserved and laconic, but at the same time, strong-willed and confident, "white" style has quickly become fashionable. Do not confuse it with the bride's makeup because white, being a determining color in both styles, is used in a completely different interpretation. 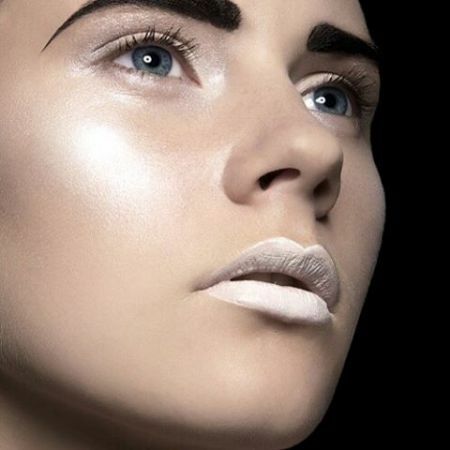 When choosing white makeup, you should first and foremost decide on its purpose because there is nothing worse than looking "nice, but not for the right occasion." Let's talk about what will help us and how we can create "white beauty." It is difficult to say how many thousands of used sets of eye shadows have been thrown out with a box of untouched white shades. Thousands of unrealized potential to become beautiful, expressive, attractive, refined… the list goes on! Do you want to hide tired eyes, to make other shades of eye shadows brighter and cause them to tune differently, to enlarge the distance between the eyes visually or to shorten the nose visually? White eye shadow can do all of these quietly, staying on the sidelines. Often chosen as the basic material for creating makeup, they decisively change the face of a woman, specifically combining the charm of the fragility with a sense of deep inner strength. In this case, white eye shadows are applied as the main background—"backlight"—complemented by the other shades that should be selected in conjunction with the color of the eyes. White eye shadows should be applied starting with the inner corner of the eye and gradually moving to darker tones on the outside of their side. Attention! If you have eyes set far apart and you want to conceal it visually, this technique cannot be used! ★ Apply white eye shadow under your eyebrows in order to prevent the effect of deep set eyes. ★ In order to visually lift the outer corners of your eyes, to make them a little slanted, white eye shadows are applied under the wings on the upper eyelid. ★ You can visually enlarge small eyes by slightly lifting and extending the wing on the outside of the eye, filling the space beneath with the white eye shadows. In this case, the wings should not be applied with very dark eyeliner, and a white pencil on the inside of the eye should be used. ★ Girls with brown eyes can try to use white mascara in combination with white eye shadows. But note that the makeup should be professional. ★ White eye shadows can be used on the cheeks, and even lips, as a base for lipstick or gloss. In this case use eye shadows of dense structure. ★ A stunning effect is made by drawing a white wing from the outer corner of the eye towards the temple by going up and dividing the eye shadow makeup. ★ Before applying a lipstick or a lip gloss, take a white pencil and draw the lip contour, going a little bit beyond the lip line. This will visually enhance your lips and prevent the "smearing" of lipstick. ★ Some white shadows applied on the upper lip will visually reduce the length of the nose. ★ Circle eyebrows with a white eyebrow pencil, and their line will become sharper. ★ Don't be afraid to use a white eye pencil on the eyelashes of the lower eyelid (inside the eye). This method will take the signs of fatigue and lack of sleep off your face. ★ The best white pencil for makeup is the one that has a uniform color intensity and plastic texture. It's great if it has a chamfered applicator at the opposite end of the eye pencil. Like the article «Subtleties of White Eye Makeup:»? Share it with friends!